Smart contracts and Initial Coin Offerings (ICOs) in particular have been of great interest to the people that wish to explore blockchain technology. This is hardly surprising considering that smart contracts have great potential when properly executed as evidenced by the numerous successful ICOs. However, even for all the success and potential success that smart contracts have enjoyed, it has been somewhat problematic to secure them. For a long time now there has been no way to secure smart contracts until Quantstamp came along. Quantstamp can simply be described as an automated auditor. It is the Deloitte or PwC of smart contracts. It reviews smart contracts checking for bugs, bad actors, or other such like problems. 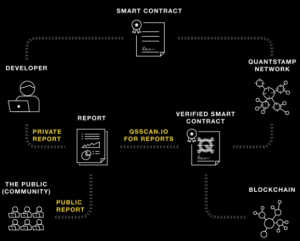 Quantstamp promises to be the auditor that has been lacking in the world of smart contracts. The fact that the concept of smart contracts has been well appreciated by developers from all over the globe is self-evident. However, it does not mean that implementation of the technology has been successful. Securing smart contracts is something that has proven far more difficult than people realize. 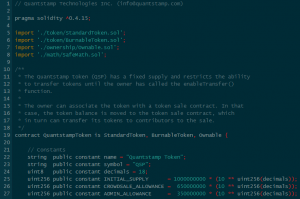 Quantstamp is a proposed solution to the problem of securing smart contracts. The goal of the team behind Quantstamp is the establishment of a new protocol for securing smart contracts, which it will be doing using scalable proofs-of-audit. Audits of smart contracts were previously done long after the technology has been used for fundraising purposes. However, doing so well ahead of time would have been more preferable since it can help investors make better investment decisions. Up to this point, most projects have not taken the route of assessing smart contracts before deployment, which is somewhat weird. Quantstamp aims to change all that given sufficient time. It is not a guarantee for success, but it is good to see that more companies are now focusing on the auditing of smart contracts since audits are important to companies that rely on smart contracts. The aim of the project is to provide the audit service cost-effectively. Scalability is another area of focus, even though it is not very easy. It is still yet to be seen whether Quantstamp is successful in this regard. The project also has a proof-of-audit protocol that removes centralization from the audit process. Why Should You Trust Quantstamp? You might be wondering why you should trust a centralized actor such as Quantstamp considering that it could be compromised too. However, this should not be an issue of concern since its protocol removes centralization from the process of auditing, which means that a single bad actor in Quantstamp cannot green-light a project even if they have been compromised. This assurance is great in the world of unregulated ICOs that have seen investors losing a lot of money. 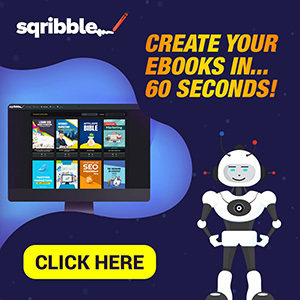 Does the Project Have Proof of Concept? Auditing smart contracts sounds like a great idea, but how can you be sure that the idea works? Quantstamp has successfully completed a security audit with one of the biggest ICOs in 2017 involving the Request Network. The fact that Request placed in trust into Quantstamp is a good sign and bodes well for the future. It is still clear that a lot of work still has to be done with regards to proof of concept, although it highlights the fact that the team is actively involved in offering a valuable service. The company is using a specialized network connecting developers, users, and investors with a view to achieving a new degree of accountability and transparency. Smart contracts will be automatically checked to identify and expose any vulnerabilities. Bounties will be provided for automatically rewarding those that successfully identify any bugs or vulnerabilities. Quantstamp is managed by a very capable team lead by Richard Ma the CEO and Co-Founder, Steven Stewart the CTO and Co-founder, Edward Zulkoski the Senior Security Engineer, Vajih Montaghami a Senior Security Engineer, Prit Seth the Lead Backend Engineer, Anna Kao the Graphics and UX Designer, and Krishna Sriram the Community manager. The team is backed by an equally capable team of advisors. Watch the presentation below from the CEO Richard Ma. Quantstamp had a Hardcap of $30 million, which includes both the presale and the crowdsale. The Presale is for $11 million while the Crowdsale is for $19 million. Scalability: Quantstamp uses a protocol designed to verify all Ethereum project and become a fundamental part of the mainstream adoption for Ethereum. Secure: Centralized audits are quite vulnerable to inside attacks, but Quantstamp’s proof of audit protocol is designed in such a way that malicious actors are unable to manipulate the audit results. Cost-Effective: Smart contracts can only play an important role in the future of many industries with auditing of the code. Run-of-the Mill Checklist: One of the greatest problems faced by audit companies is failing to do due diligence. It is still early to tell whether Quantstamp will critically evaluate every contract and whether it will do due diligence on each company. Marketing is Still Needed: The idea of community marketing might be solid, but it is important for Quantstamp to do some marketing since it cannot rely on investors only to source work for them since it is in a service business. It is good to see that there’s growing focus on securing smart contracts. A service such as this one is long due, even though anybody can check smart contracts on their own in most cases. The fact is that such information is typically never hidden from the public. Still, it does help to create a protocol for undertaking the audits instead of depending on human beings to do it. The future seems bright for Quantstamp even though it will be interesting to see how many companies and users actually use the service in the future. Quantstamp is a promising idea that promises to revolutionize the administration of smart contracts and definitely has potential. It is why investing in the Quantstamp ICO is highly recommended. Note: This is Not Financial Advice. Follow the links below for more information about Quantstamp. Presale Bonus: 20-100% bonus for the presale participants.